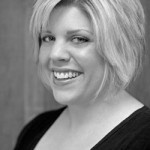 Share the post "Spring and Summer Fashion Trends"
Spring is in full swing and Summer is around the corner. It’s time to update your closet a with fresh new look. There are a lot of bold statements being made in fashion this season. Here is just a glance at these wearable fashions that dominated the runway. While we are still seeing short shorts this season, 2013 is also bringing back the longer shorts. You can dress either casual or fancy with bermuda shorts this spring. 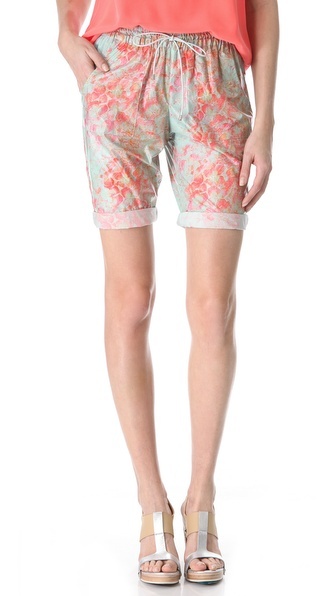 Check out these slouchy, floral shorts by SUNO. You can’t go wrong with these chic shorts that are flattering on all body types. If you are looking for something that will go with just about anything, you will love these denim cutoff shorts by Citizens of Humanity. When you think of spring trends, you probably think of flowers and pastels. However, this spring, black and white is making its appearance in everything from bold checkered patterns to color blocking. You can never go wrong with black and white. Make sure to pick up a sporty black and white dress this spring, like this Herve Leger Graphic Bandage Dress. You also can’t go wrong with this classy Halston Heritage colorblock strapless dress. It’s perfect for that special event! We love stripes! Both black and colorful stripes are making their appearance everywhere this season. Go bold with this colorful top by Dolce & Gabbana or go for a more conservative look with this nautical fit and flare dress by Kate Spade. You can wear stripes year round and they aren’t a style that is going anywhere soon, so make sure you have plenty of this must have style in your closet! Are you looking for something chic enough for work yet still casual enough for a night out on the town? Short suits are the answer. If you only add one thing to your wardrobe this spring, let this be it! They are both sophisticated and fun. 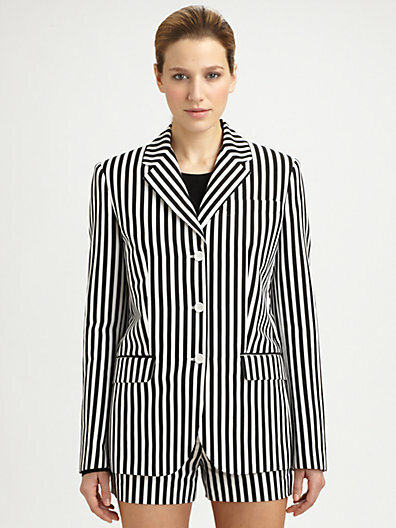 Try this Michael Kors black and white striped short suit. It is the perfect piece to add to your wardrobe this spring. Sheer fashion is making a statement this spring. If you are looking for a bold and daring piece to add to your wardrobe, this is it. Check out this sleek sheer stripe top by Jean Paul Gaultier. However, for those of you who aren’t ready to bare everything, sheer fashion also looks great layered. 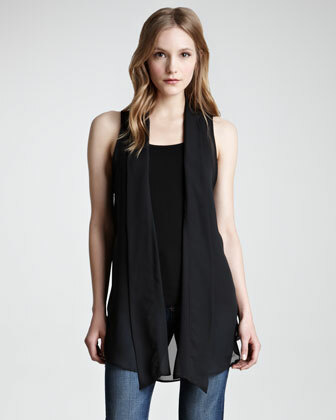 We love this sheer vest by Patterson J. Kincaid. Add a little femininity to your collection this season with oversized ruffles. Ruffles are making a come back and we aren’t talking about the “princessy” kind of ruffles we saw in the 1980’s. 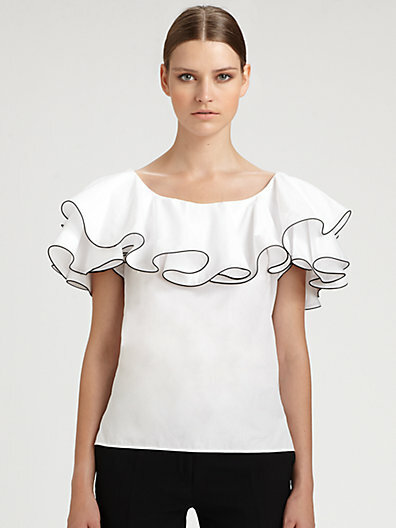 Today’s ruffles are sculpted, modern, and fresh, like this white pierrot top by Alexander McQueen. 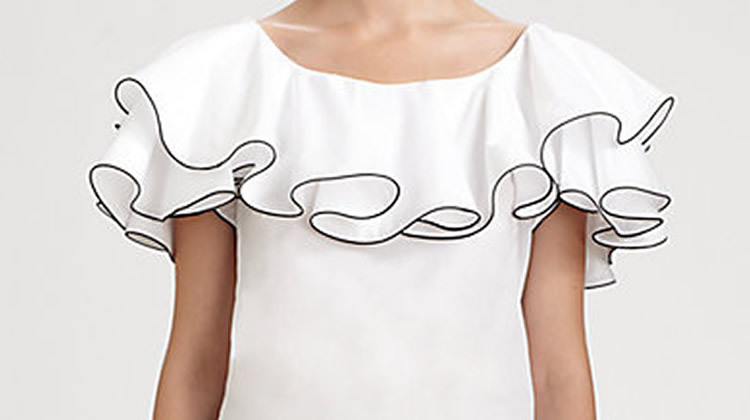 You will also see ruffles as a single wave on a structured silhouette, like this pale pinkDiane von Furstenberg bobbie ruffle top. Now you know what is sizzling for spring, but how can you update your wardrobe without blowing your time and money? Try Shopscotch, a free online service that notifies you when things go on sale. Just install the Shopscotch button in your web browser. Then you can use it to watch products from your favorite retailers. Shopscotch will notify you when the price drops! I love Bermuda shorts! So cute for summer. I like the Bermuda shorts, looks like my style! Loving the black and white trend!